Recognize this? It's the Manhattan Branch of the NYPL, of course! Even if you've never been to New York City, you probably recognize this famous building, located on the corner of 5th Avenue and 42nd Street in Manhattan. For those who assume that libraries are relics and destined to go the way of the dodo bird and the dinosaur, I'm thinking that's probably untrue, at least in the near future. Americans love libraries, we need libraries, and besides that, cities across the country are working hard to improve and upgrade many of our neighborhood libraries. 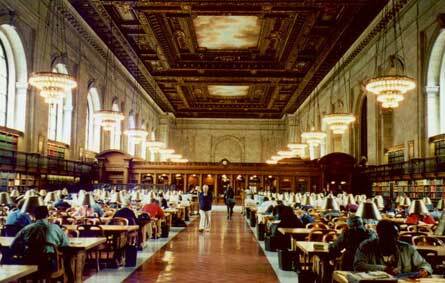 Here's a photo of the newly refurbished main reading room of the New York Public Library. Clever photographer, Jack Fox, the guy in the navy shirt and khaki pants, is walking down the center aisle, totally unnoticed by the library patrons who are completely absorbed in their reading. In another moment, he is going to lie down on his back, right in the aisle, and snap a photo of the ceiling. This looks like a work of art to me! Here's the photo he took. Isn't it beautiful? And the funny thing is that nobody even blinked while he photographed it. Well, what do you expect. It's New York, after all. He got up and he didn't even have to dust himself off, because the place is still spotless, and out he went. If you look carefully at the photo just above this one, you can make out the beautiful ceiling mural. 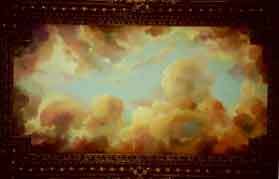 That's what you see when you day dream in this library. It reminds me of those beautiful old Renaissance buildings in Italy, where all surfaces, including ceilings, became works of art. What great thoughts may cross your mind when you see that mural. The sky's the limit. Look up from your desk right now. What do you see? I'm guessing, but it very well might be acoustical tile with all those little holes in it, and maybe it's dirt-stained and leaky. Now, look again at the people in the reading room, sitting at those long tables. How civilized! No heartless florescent lighting. In our new modern age, we sometimes forget these amenities that were so important in the early part of this century. 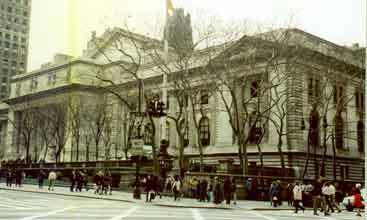 If you're interested in learning something about this building's origin, go to their website: www.nypl.org. There you'll find lots of information, including an article on the stone lions, Patience and Fortitude, that guard the entrance. There's even a statistics page for those of us who are always awed by numbers. For example, the total support and revenue for the system (that's money coming in) for 1998 was just over two hundred million dollars. The total operating expense for that year was just under two hundred million. That's nice. Unlike amazon.com, they are not running in the red. And get this: there are 85 branches; and the collections contain over ten million items, just under 5 million of which are books. (What on earth are the other 5 million items, if not books?) There are 2.73 million library cardholders, and over thirteen million people used the library in fiscal year 1998. I'm impressed.